Homefront will have dedicated servers for PC, Xbox 360 and PS3, and developer Kaos thinks it's just the way to go. It's hard to imagine the sort of controversy that surrounded the announcement that Modern Warfare 2 would have no dedicated servers for the PC version (not that it stopped the game from selling roughly a hojillion copies). 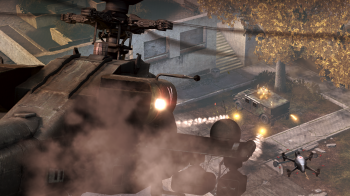 At an event meant to show off the game's multiplayer, however, Homefront publisher THQ announced that dedicated servers were the way to go - on all platforms. Homefront creative director Dave Votypka assured The Escapist that his studio wouldn't leave PC gamers out in the cold, either. "What we've been doing with the PC product the whole time has been to deliver PC-specific features that the community really wants," like dedicated servers, clan tools and probably moddable tools as well. "Some PC gamers have been a bit neglected - or felt a bit neglected - over the last 5 or 10 years with the consoles really rising up, and we come from that heritage." "We know what they're looking for - the clan players, the tournament players, and the PC developers ... we have a whole PC game catered to the PC community and we'll be announcing more details pretty soon." Meanwhile, senior designer Brian Holinka told Joystiq why dedicated servers were important, even on consoles. You have to think about your constraints when you're making a game. If we host a server on a console, all of a sudden, that console is both server and it's playing the game. That really lowers everything: player count, the number of vehicles, everything. Dedicated servers allow us to offload all that work and basically all the client has to worry about is running the game. As a result, said Holinka, the game could support 16-on-16 matches with every player able to summon vehicles, air strikes, and the like. Check our coverage of the Homefront multiplayer event here!